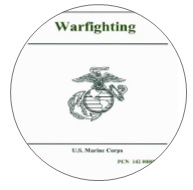 Warfighting: History of the MCDP, Roots of Maneuver Warfare, and the Doctrine in Action explores the development of the Marine Corps capstone publication MCDP 1 - Warfighting. The road to our current doctrine in the Marine Corps started well before the noted decade of change began. Our own doctrine points out many episodes of the application of Maneuver Warfare before we began to institutionalize our current philosophy of warfighting. The structure of the site should look vaguely familiar to you - it has been organized to look like the Marine Corps Planning Process. At each point in the circle, you can enter and find out more about a specific topic. Hopefully the institutional change the Marine Corps went through will make you interested in looking deeper. We hope, as LtGen Van Riper says, you will “cast your net widely” and realize that the tenets of doctrine do not necessarily arise strictly from warfighting but can be fed by a wide variety of concepts and themes. Context and Background: The “Context” link starts the journey. Where did some of the ideas come from? Some familiar names come to mind: Sun Tzu, Clausewitz and Col John Boyd. These concepts are a portion of the genesis of our warfighting philosophy. The Debate: Once the concepts were tied together, how did we manage the debate to change? Follow the debate through articles (courtesy of the Gazette) that were both pro and con on the concept of maneuver warfare. In order understand the debate the Marine Corps had, it is recommended the reader read at least one article from each group. Institutional Reform: How did the Marine Corps change? Bureaucracy is defined as organization “characterized by specialization of functions, adherence to fixed rules, and a hierarchy of authority” – since the Marine Corps fits this description, how did this bureaucracy change? Application: Finally, application. Did we move forward and implement maneuver warfare as a Marine Corps-wide philosophy? Alfred M. Gray, Paul K. Van Riper, and John F. Schmitt discuss how the Marine Corps changed throughout their careers. The discussion revolved around warfighting tactics and maneuver warfare. The topic of this excerpt is "warfighting as a philosophy."